This paper discusses the relationship between policy research and policy change, and it provides examples of the policy research outcomes informed by the Rehabilitation Engineering Research Center on Mobile Wireless Technologies for People with Disabilities’ (Wireless RERC) policy research process. In 2005 and 2006, the center conducted empirical research, using the policy Delphi polling methodology, to probe key stakeholders’ opinions on the most significant issues surrounding the adoption and use of wireless communication and information technologies by people with disabilities. Drawing on the results of three rounds of polling, the Wireless RERC developed a set of policy options, and “fine-tuned” them using participating stakeholders from the disability community, wireless industry, and policymakers. 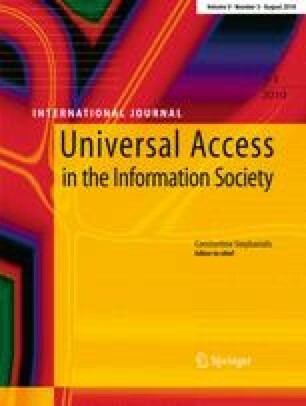 A preliminary version of this article was presented at the 2008 Cambridge Workshop Series on Universal Access and Assistive Technology (CWUAAT), held at Fitzwilliam College, University of Cambridge, April 14–16, 2008. The authors wish to thank the participants of the Policy Delphi and to acknowledge the research assistance of Alan Bakowski, Andrew Ward, Avonne Bell, Lynzee Head, Christine Bellordre, Jason Anavitarte, Andy McNeil, Adam Starr, and Lisa Griffin. The Rehabilitation Engineering Research Center for Wireless Technologies has been supported by the National Institute on Disability and Rehabilitation Research (NIDRR) of the US Department of Education (DOE) under grant number H133E060061, and H133E010804. The opinions contained in this paper are those of the author and do not necessarily reflect those of the DOE or NIDRR.